In April 2014 more than 200 girls were kidnapped from Chibok Secondary School in Nigeria by a militant Islamist group. Over the following two years there were occasional escapes and rescues, rumours and misinformation, accusations and recriminations. There was also an international twitter campaign #bringbackourgirls which was backed by a host of celebrities. And yet most of those girls are still missing. Theirs is the world recreated in Girls, a challenging new drama by Theresa Ikoko currently playing at Birmingham Repertory Theatre's Door. Ikoko's story focuses on three girls, Tisana, Ruhab and Haleema, who, we learn, have been kidnapped a few weeks ago. The three are school friends, girls from the same village, who have all grown up together and are determined that their way to survival is to stick together. But as time passes and tensions grow, that friendship is tested. The three are very different – Tisana is a strong Christian who is prepared to face repeated whippings rather than join a Muslim prayer. Ruhab believes her only hope for survival is to marry one of the militants and begin a new life. And Haleema is convinced that escape is their only option. The cast of three, Yvette Boakye, Abiola Ogunbiyi and Anita-Joy Uwajeh, give outstanding performances as the girls and there is no let-up in the drama. One moment they are in the depths of despair, the next they are play-acting their favourite television story and the next they are battling from their different standpoints. Directed by Elayce Ismail, the story is told through a series of snapshots with the audience never being given a detailed idea of timeframe, the ages of the girls or their past lives. It all becomes concentrated on the here and now so that their lives before become lost in a blur of fear, intimidation and death. And Ikoko doesn't shy away from shaming those in power whose response to the missing girls has been a twitter campaign, a lot of publicity but very little action. During one heated debate in which Tisana assures the girls they will be rescued, Haleema tells her friends that 'nobody cares about us' and their only hope lies with themselves. 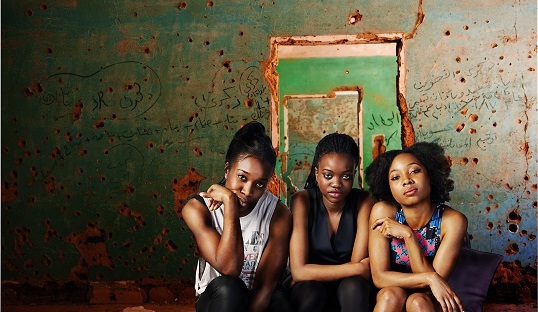 A co-production between Soho Theatre, Talawa Theatre Company and HighTide, Girls is powerful and thought-provoking drama which shines a light on a largely forgotten tragedy.